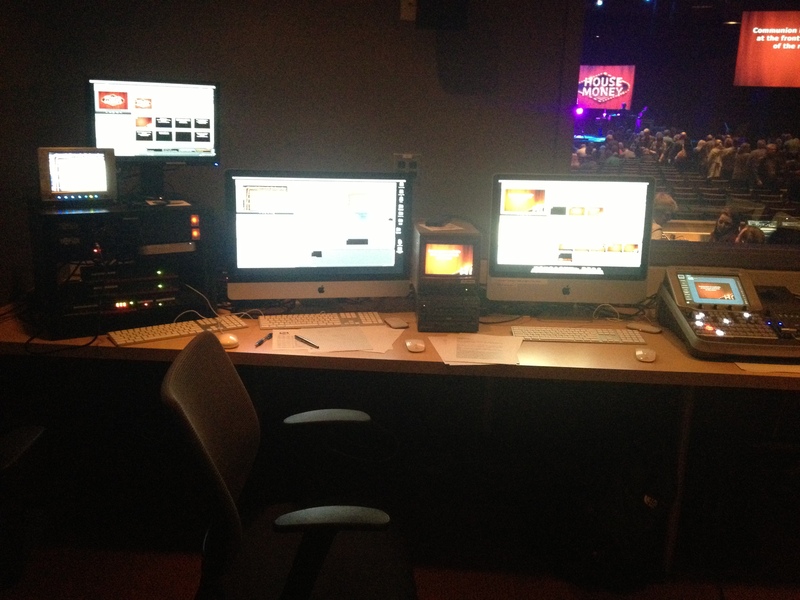 When I started working at SouthBrook almost 2 years ago the video system was extremely different than it is now. I also knew nothing about IMAG (Image MAGnification… AKA shooting live video and putting it on screens on or next to your stage) or live video at all really. I was originally just there to run sound and do other various tasks for the production team. I soon began to do more with pro-presenter and eventually started learning a little bit about how video worked and how our system in particular worked at that time. There was already a plan to update the video system and the equipment had even been purchased and was at the church ready to go when I started workingthere but it took about a month to find an opportunity to get it installed and running. This is when I really started learning. Our original system contained two separate switchers, one that fed into another. At one switcher (a sony) all of the cameras were mixed and then fed over into another switcher (a grassvalley) that either keyed lyrics or took the computer feed and the output of the second switcher was then sent to the projectors. As you can imagine this made for a few extra frames of delay that weren’t extremely optimal. In fact the delay was so bad that one of the main motivations for buying a new switcher was that people couldn’t clap on stage due to the delay because on screen it looked like they were out of time. The replacement was a Blackmagic ATEM 2M/E switcher with the ATEM 2M/E broadcast panel. This was a huge upgrade. Obviously. Everything fed into this switcher now and out to the projectors. I don’t have many pictures of the before but heres some shots of the old computer graphics area. 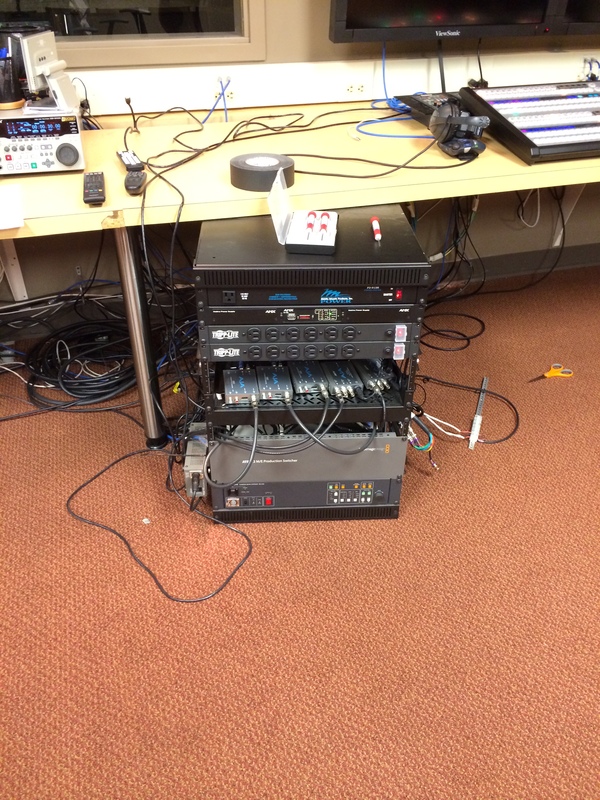 The old sony video switcher and all of its converters used to live in a rack below the counter just to the right in the first photo. On the counter sat a wall of CRT monitors and the switcher controller. Behind the left iMac in the second photo on the counter is where the projector feeds and video converters used to sit. The smaller screen on the rack in the left of the second image was our old monitor for the atrium video feed. The larger monitor just to the right of the smaller one on the rack was the center screen computer. The CRT monitor between the 2 iMacs was a preview feed from the video switcher. As you can imagine this work environment was pretty messy and crammed. In all reality it probably wasn’t too far off from what I’ve seen in a lot of pictures of video tracks and vans meant to be used on location at events and what not. The amount of space we had in the room however, begged for some reorganization of the work area. If ever I come across pictures of the original sony switcher in its original resting place, those will go here. 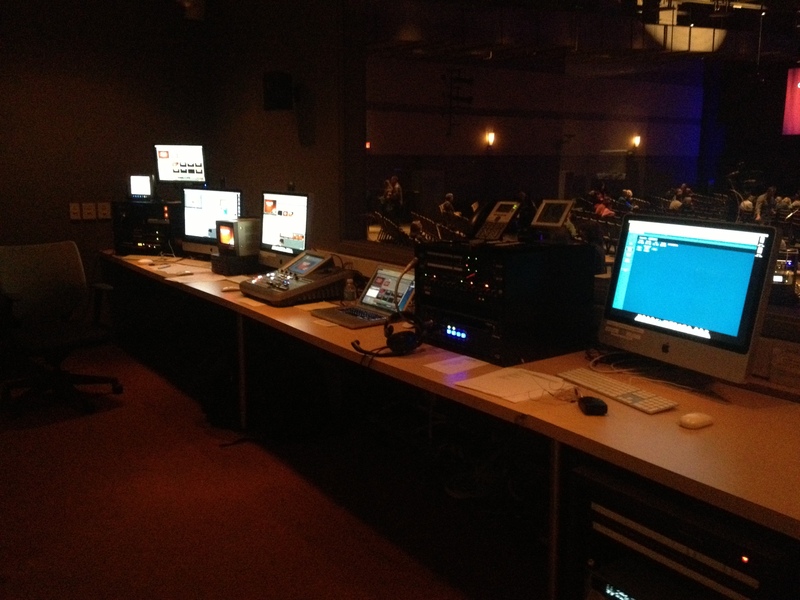 In late 2012 we replaced the grass valley and sony switchers pictured above with the BlackMagic Designs switcher. When this happened we also put together this rack of converters, controllers, and the switcher computer. This was when the 2, 30″ monitors were installed on the wall and the process of cleaning things up in the video world really began. On the other side of the counter where the computer situation had been a little messy, I moved some things around and cleaned some things up by racking all of the projector and output side converters and tidying up the iMacs. Note the area to left in this picture. The rack that was empty under the counter o the left is where I put all of the converters and boxes that were in the rack on the counter top and the converters that were sitting in a pile behind the computers on top of the desk. Upon the request of a overhaul of our old small theater (will detail in full in a later post) we were asked to make a list of things needed for turning that rooms video experience into something that would be inviting for a live streamed video venue to buffer attendance in our main theater on the weekend. The first thing we noted was that out existing equipment needed some help before we went straight for the idea of sending video over there. There were a few main issues with what we were doing at the time that needed addressed. There was not a good way to route things for what we were doing. We had just been running everything out of the Atem and into video splitters then out to converters for projectors and TV’s and what not. 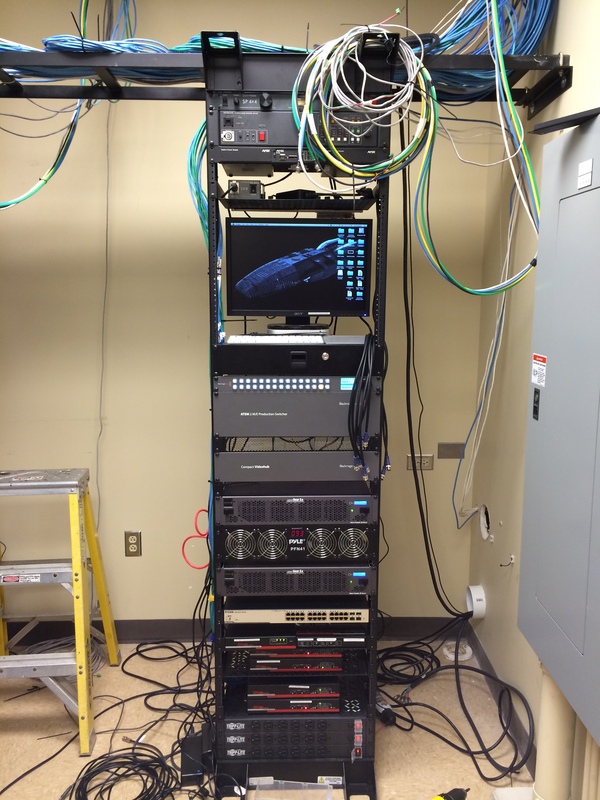 Our fix was to buy a video router and run every video input and every video output through it so that we could have control over what went where with the push of a button. This is easily the best and most important update done to our entire video system. The router allows us to add potentially 40 inputs to our switcher and route our feeds or even our cameras or computers to anything we want. This doesnt seem like much but when you are recording and streaming your video feed to multiple rooms and screens its a life saver. Our robotics station was pretty outdated. We have 2 robotic cameras, one on each side on the room, and the station where these are controlled was a sad site to be seen. In the photos above you can see it to the right side of the room. It was 3 CRT monitors that showed each of the cameras and a program feed. The screens were 3:4 and cropped the video sent to them so our camera ops couldn’t actually see the entire image they were shooting. I replaced these three monitors with 6 Black Magic SmartView Displays. 2 of them being their 17″ HD displays and 4 of them their Duo displays. I also gave each station a VideoHub Smart Control. Each station could now see effectively anything they want that was hitting the video router. Our graphics and lyric video keying over video from our iMac wasn’t ideal at all. We were luma keying our lyrics and making custom lower third alpha images that we would load into the ATEM media source library and then use to key graphics. This made our pro presenter lyrics pretty ugly on transitions. Imagine every time the lyrics slides changed instead of a nice clean dissolve transition it were all blotchy and distorted while in transition, this is what it looked like. The fix: Dedicated alpha keying on everything. I moved our mac pro over to the main graphics computer and bought a Black Magic Deck Link PCI graphics card. I also purchased pro presenters alpha keying module which enabled us to do keying with PNG’s natively given they had transparent info in them. This gave our lyrics a dedicated channel for the switcher to see the dissolve transitions rather than trying to tell the switcher to interpret the transitions on its own. Long story short, things that were being laid on top of video looked very clean. We also bought a cinema display for the iMac. 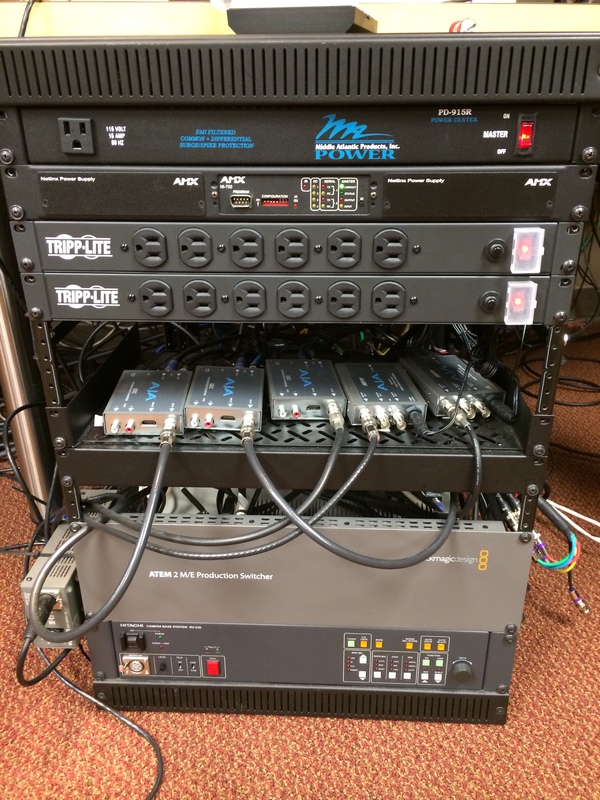 One of the things that we had an abundance of in our production space were converters and splitters and video over UTP transmitters and receivers and tons of just really random but necessary rack mountable boxes. 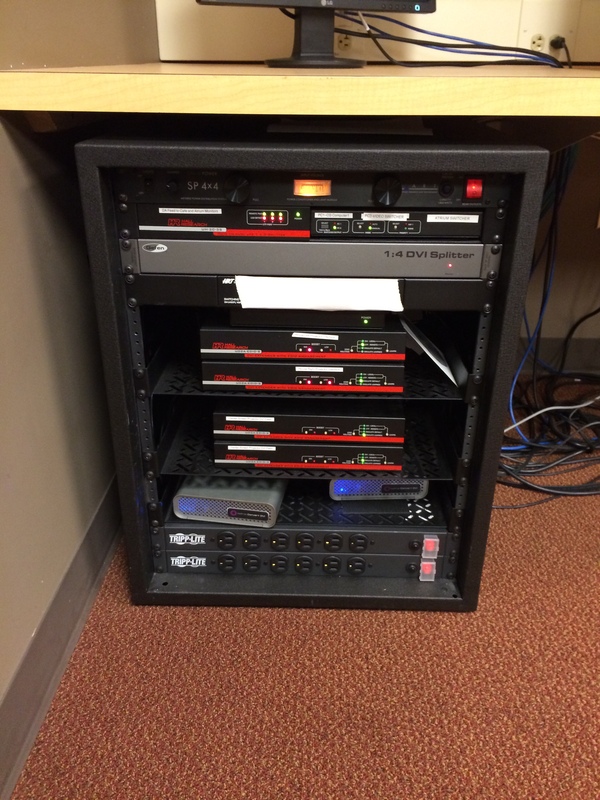 Enter my pride and joy… the video closet. Moving everything into a rack in the closet of the production room was a huge step. 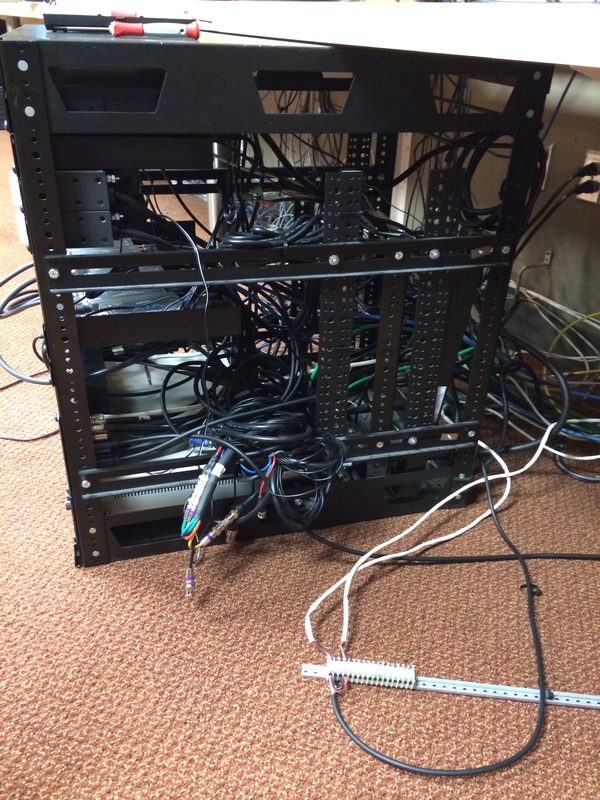 This cleared almost everything from under the countertop out of the room and into an easy to work on rack that was completely isolated from our production space. I cannot tell you how clean this made the room. It was honestly like a whole new space with all of the extra room we had to work. 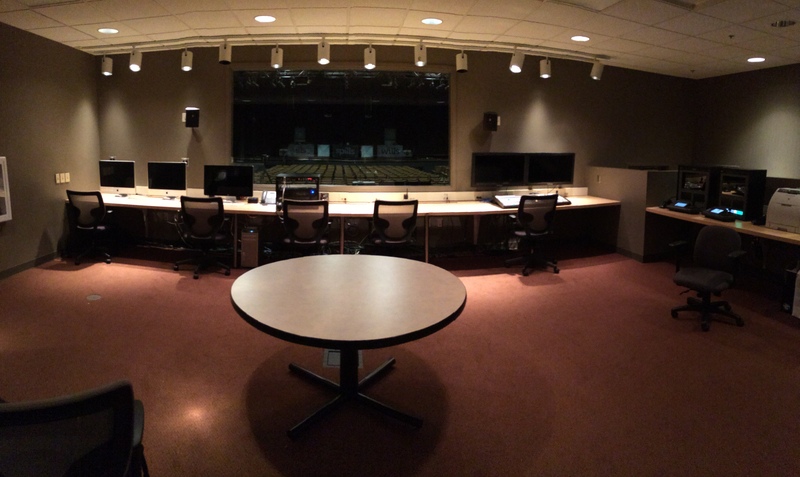 I was able to really clean up the computer area and remove the switcher computer and converters from the room. In doing this we also decided to update our converters with 2 BlackMagic OpenGear Bays, these 2 bays house all of our UDC, Format, and Genlock cards.